The testimonials provided on this page are from patients that obtained good results. Please note that results may vary. These testimonials are solely posted upon request of prospective patients and are not intended to misguide, misrepresent, exaggerate, inflate or overemphasize the risk versus benefits profile of these regenerative medicine procedures, nor the effectiveness thereof. Only qualified patients are candidates for treatment. The health care professional will determine if stem cell therapy is appropriate for you. Our patients have the opportunity to express preferences and values before collaboratively evaluating and arriving at treatment decisions. Learn all about stem cells and stem cell therapy, and find out if stem cell therapy may benefit YOU! Neo Matrix Medical is the premier leader in Regenerative Medicine & Stem Cell-Based Therapies. Utilizing state of the art imaging technology for precision deployment of tissue allograft's. Lisa Sasso is a multi-talented and well-trained individual in many different areas. She is a co-owner to her husband’s property management business where she worked as a renovation and maintenance manager. After about five years Sasso Properties became self-sustaining, so she realized it was time for a change. She bravely joined her husband on a new adventure and partnered with Neo Matrix Medical where she started out part-time in customer service. Lisa, being a team player and supportive of Neo Matrix Medical, decided to go full time to help further grow the company in 2019. Lisa enjoys working and loves to be challenged and working for Neo Matrix Medical offered both of those opportunity’s while providing a flexible schedule for her husband and four children. Lisa personally enjoys hands-on crafting, sewing, event party planning, and the beach. Victoria Cattell-Bass is a Certified Holistic Health Coach, Life Coach, and Transformational Life Therapist. She worked in the medical field as a Diagnostic Medical Sonographer for 12 years before transitioning to holistic medicine. She earned her health coach certification from The Institute for Integrative Nutrition and went on to earn certifications in Life Coaching and Transformational Life Therapy. Victoria is a board certified holistic health practitioner with The American Association of Drugless Practitioners. Laura Wagner has been in the Dental/Orthodontic field for over 19 years. In that time she has learned many valuable skill sets like how to manage a team and care for patients. Laura has trained alongside one of South Fl leading Drs which has given her the ability to fine-tune her skills! Customer service and Laura’s passion for her patients has always been her number one priority. Laura is always seeking new challenges and a way to help others. After experiencing most the dental field had to offer she redirected her career path and joined Neo Matrix Medical. Laura is very excited about being on the four front of medical advancement. As an asset to the team, Laura plans on implementing her Marketing, Managerial, and Customer service experience to work. Laura is married with 2 children. She has a passion for fitness and loves health and wellness. Laura loves to travel, run, dive, boat rides, fishing, hiking, anything to keep her moving with her family! Tracie has been working in the field of ultrasound for nine years. She completed her studies in Melbourne, FL where she graduated with honors and received her Associates of Science degree. She went on to earn her RDMS registry credentials. (Registered Diagnostic Medical Sonographer). For the past 8 ½ years, she has worked at a community hospital located near Marine Base Camp Lejeune in Jacksonville, NC. During her time there, Tracie served as preceptor for multiple students and was instrumental in the ultrasound department being recognized as outstanding clinical site by two graduating classes from the diagnostic medical sonography program at a local college. Throughout those years, she cared for a countless number of patients and worked alongside numerous physicians and radiologists by providing the diagnostic images that helped aide in the treatment of those patients. Her decision to enter the healthcare field is validated on a daily basis by the rewarding feeling of playing an integral part in the care, treatment, and improvement of her patient’s health. Daytona State College and went on to build her business management career in Volusia county. were she was the office manager/administer for over 33 years. Matrix Medical. She felt this was the time to be involved in building a new and exciting practice. through safe, effective and innovative Stem Cell therapies. daughters, and two amazing grandsons. Is an Advanced Registered Nurse Practitioner with over 15 years of nursing experience, specializing in Emergency and Critical Care. Born in Caracas, Venezuela, he is fluent in Spanish in addition to English. Luis started his journey in the medical field as an EMT-Paramedic at Ryder Trauma Center in Miami, Florida. After 7 years, he decided to pursue a career in nursing. In 2003, Luis graduated from Broward College with his Associate of Science in Nursing. His passion was always the Emergency Department, but he has extensive experience in Critical Care, Stepdown, Med-Surg, and Telemetry, as well. Luis enjoys traveling, so becoming a Travel Nurse was a natural decision. He has traveled from Florida to California and worked at almost 20 different hospitals along the way. Luis settled down in Florida and, in 2013, decided to advance his nursing degree from Associates to Bachelors. He graduated in 2015 with his Bachelor of Science degree and was awarded with the Nightingale Pride Award. In addition, Luis won the Community Health Systems Employee of the Year in 2015. Luis’ ambition continued and he earned his Master’s Degree in Nursing, with high honors, while working as the Nursing Supervisor at a Florida Hospital; thus achieving his dream of becoming a Nurse Practitioner. Luis is certified as an Adult-Gerontology Nurse Practitioner by the American Nurses Credentialing Center. Dr. Mike Van Thielen, PH.D, HOLISTIC NUTRITION AND WELLNESS / STEM CELL EXPERT, AUTHOR, AND KEYNOTE & MOTIVATIONAL SPEAKER, has been involved in optimal health practices, anti-aging and regenerative medicine, sports performance, nutrition and supplementation for nearly three decades. As a top swimmer in his native Belgium, he gained interest in optimizing health and athletic performance. Dr. Van Thielen graduated from the University of Brussels (Belgium) in 1993 with a bachelor’s degree in physical education and in 1995 with a master’s degree in physical therapy. He served as the assistant coach and physical therapist for Belgian Olympic swimmers in preparation for the 1996 Olympic Games in Atlanta. Dr. Mike moved to Florida in 1997, and after managing several pain management clinics, he pursued his master of science in Oriental medicine and his bachelor of science in professional health studies from the Florida College of Integrative Medicine in Orlando. Dr. Mike is a licensed physical therapist, a licensed acupuncture physician, and a doctor of Oriental Medicine, with certifications in injection therapy, homeopathy and homotoxicology, Chinese herbal medicine, and non-invasive cosmetic procedures. He also has a Ph.D in Holistic Nutrition from the College of Natural Health. Besides being well-versed in various health applications, Dr. Mike Van Thielen also holds many business and marketing certifications. He has a vast business experience and a proven track record of establishing and developing successful business operations. Dr. Mike owned several anti-aging clinics in central and northeast Florida and developed a successful system to create customer loyalty that boosted new customer referrals and resulted in retaining more than 90% of existing customers. In 2008, he founded a company that certified health care professionals in health and wellness programs, sensible weight loss, and natural non-invasive cosmetic procedures, and trained over 1,000 professionals in just a few years. Dr. Mike sold the business in 2014 and has since dedicated himself to bio-regenerative medicine applications and stem cell therapy. Dr. Mike is the author of the revolutionary book “Health 4 Life – User Manual and is featured in the book “Motivational Speakers America – The Indispensable Guide to America’s Business and Motivational Speakers as a Top Keynote Speaker alongside celebrities such as Les Brown and Brian Tracy. Dr. Mike currently continues to swim records in swimming pools around the world and professionally is the President/CEO of Neo Matrix, LLC. He is determined to establish Neo Matrix, LLC as the authority in stem cell applications in the USA. Graduated in 1996 as a Doctor of Osteopathic Medicine from Western University of Health Sciences, College of Osteopathic Medicine of the Pacific, Pomona, CA. Dr. Coleman has over 20 years of clinical experience in family practice and held several positions as an Associate Medical Director and Medical Director in hospitals, primary care facilities and hospice care. Dr. Coleman is a licensed Osteopathic Physician in the State of Florida and Board Certified in Family Medicine and Hospice. He holds certifications in Basic and Advanced Cardiac Life Support, Workman’s Compensation Examination and Clinical Densitometry. He is an active member of the American Osteopathic Association (AOA) and the Florida Osteopathic Medical Association (FOMA). Dr. Coleman has experience in Interventional Medicine procedures, including intra-articular and spinal injections under ultrasound and fluoroscopy guidance. Dr. Coleman is a member of our medical team providing regenerative medicine and stem cell-based therapies at Neo Matrix Medical and also fulfills the position as Associate Medical Director of the clinical research unit at Covance Clinical Development Services in Daytona Beach, Florida. Dr. Michael Thrasher, MD, PhD. I have a Ph.D. from the University of Georgia in Behavioral Neuroscience and I was a postdoctoral fellow in Neuropharmacology at Oregon Health and Sciences University in Portland. I was a National Institute of Drug Abuse fellow as well. I investigated the serotonergic and dopaminergic mediation of Ethanol and Cocaine abuse as it pertained to their rewarding properties as reflected in a place preference and taste aversion conditioning paradigm. I had a Publication in the Journal of Alcohol in 1999. I presented the findings of several studies at the NIDA meeting in Portland on November 21, 1998. Also, I presented findings at the November 1998 Society for Neuroscience Meeting Los Angeles pertaining to Serotonergic and Dopaminergic modulation of Facilitative and aggressive behaviors in hamsters, and the differential effects of Clozapine and Cyproheptadine on Defensive and Nondefensive aggression. I attended Medical School in Europe at the Medical University of Silesia in Katowice Poland. I completed a rotating internship in Fajardo Puerto Rico at HIMA San Pablo and worked for a total of 2 years in Puerto Rico as an Emergency Physician, also I have worked in South Dakota and Montana for the Indian Health Service as both an Emergency and Primary Care Physician. The Emergency Unit in Browning Montana was the 3rd busiest in the state while I was there. I supervised Physician Assistants and Nurse Practitioners while at both the Montana and South Dakota facilities. I returned to Puerto Rico in June of this year to assist the victims of Hurricane Maria. At present, I am doing concierge medicine, Primary Care, and Medical Injury Evaluations. I was born in Livingston Tennessee on March 26, 1960, in Livingston, Tennessee. I attended Livingston Academy High School and Tennessee Technological University, I earned a bachelors degree in Chemistry and Biopsychology. I studied Neuropsychology at The University of Memphis and had a Publication in the Archives of Clinical Neuropsychology in 1990. I am a veteran of the US Army and have a service-connected disability. I served as a Biological Sciences Assistant at Aberdeen Proving Grounds Edgewood Arsenal Maryland. I am married with 3 Children and presently live in Kissimmee. I play guitar and read history, philosophy and quantum physics as a hobby. I am Knights of Columbus and a member of several IQ societies in which I enjoy brain teasers and exercises to improve outside the box thinking. Sarah Brown is an Adult Nurse Practitioner, board certified by the American Association of Nurse Practitioners, currently licensed to practice in the state of Florida. Sarah began her career in nursing in 2000 and holds a Doctor of Nursing Practice from Chatham University. Her experience includes Family Practice, Women’s Health and Wound Care, currently teaching Master’s level Nurse Practitioner students in a virtual learning platform. Sarah is a member of the local Nurse Practitioner network in her home state of Florida and is published in a peer-reviewed journal for her work related to medication adherence in elders. She has precepted new graduate Nurse Practitioner students in many settings along her career path and enjoys serving her community at a free health clinic for the underserved populations. As a decorated combat veteran, the Marines taught Michael the value of working with dedicated and skilled professionals. Michael advises both business owners and individuals in commercial transactions and dispute resolution. His complex litigation focus includes business break ups, professional liability, insurance coverage, tax, trust, real estate, contract, intellectual property, and loan disputes. The combination of his transactional and litigation experience allows Michael to see beyond just the immediate issues presented and develop practical cost effective solutions for his clients, to maximize benefits and minimize risks in both the short and long term. Primarily working with business owners and their families, Trevor advises clients on business structuring and sale transactions, regulatory compliance, third-party contracts, liability protection and general matters facing small business owners. His focus extends beyond legal advice and includes business strategy and wealth preservation. Trevor also works with families regarding their estate planning needs, including probate, trust administration, and wills. Don has been in diagnostic ultrasound since 1998 and holds his credential of RCS (Registered Cardiac Sonographer) with Cardiovascular Credentialing International. He has performed over 40,000 procedures in Cardiovascular, Trans-cranial and Musculoskeletal ultrasound. Don has served as a preceptor to Adventist Health Systems College of Health and Sciences since 2004, training 1st and 2nd-year students the techniques necessary to start their career’s in the dynamic field of ultrasound. Don currently serves a variety of organizations to perform, teach and manage their clinical operations. Among those Don serves as V.P. of Clinical Operations for Neo Matrix LLC, where he oversees clinical treatment and resolution of musculoskeletal injuries/conditions through the use of stem cell therapy. In addition to treatment, Don oversees all training for physicians and sonographers as it relates to MSK ultrasound. Don also serves as Chief Echocardiographer at Florida Hospital Fish Memorial Non-Invasive Cardiac Diagnostics Lab, where he oversees all lab functions and protocols for today’s advanced cardiovascular imaging and specialty imaging modalities. Don works closely with physicians and staff to provide detailed, accurate, comprehensive, and professional care for acute, chronic, and critical patients. In addition, Don launched and continues to run the non-invasive Cardiovascular program for a private practice Cardiology office since 2001. 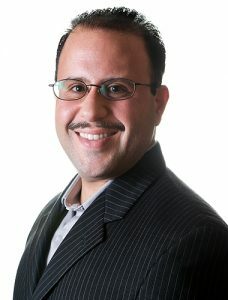 Nick Sasso is a technology enthusiast, entrepreneur, business owner, husband, and father of four. He started his career in 1996 as a part-time customer service representative for a technical support company. During his time there he held multiple positions where he learned a lot about technology, helping people, and corporate America. While Mr. Sasso enjoyed what he did he knew there were a number of truly amazing opportunities in the financial world. In 1999 he joined Jones Trading where he spent ten years, working his way up to a series 7, 63, and 55 licensed stockbroker. While at Jones, he built and maintained his own book of business and was recognized as top 5 producer in the firm for 4 consecutive years, ultimately holding the position of Senior Vice President before leaving Jones to pursue personal endeavors, including spending more time with his family and creating Sasso Properties, LLC. Within three years, Sasso Properties had accumulated 30 units with the goal of 50 by the end of 2017. Leveraging the skills he learned as a stockbroker and as a tech enthusiast, Mr. Sasso turned Sasso Properties, LLC into a well-oiled, highly automated machine. With all of his business becoming self-sustaining, Mr. Sasso found his workload began to shrink. Never one to be idle, the search for new business opportunities began. In 2016 Mr. Sasso joined the Neo Matrix team as a manager with the desire to leverage his technical, business, and financial skill set to propel Neo Matrix to new heights. He is committed to using the skills he has attained over the years to help people and is excited to be a part of a team where helping people is a top priority.